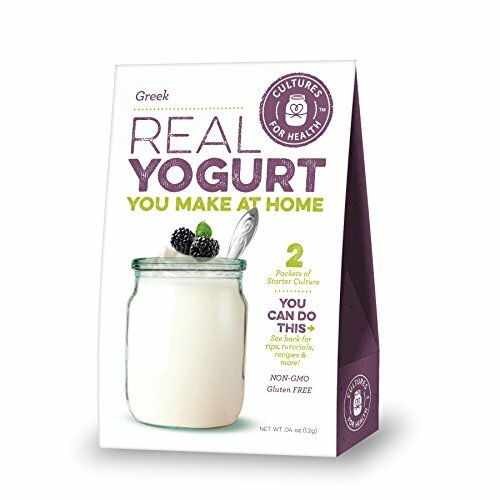 Make authentic Greek yogurt at home with this easy-to-use yogurt starter! Deliciously rich and tangy, this heirloom thermophilic yogurt starter can be re-cultured indefinitely. Drain whey from the finished product to replicate super-thick commercial Greek yogurt or enjoy as-is. Each box contains 2 packets of yogurt starter. Activate 1 packet using 1 quart pasteurized milk; store 2nd packet in the freezer as a back-up. Yogurt cultures at 110ºF using a yogurt maker or other appliance. This yogurt culture is also suitable for use with raw dairy milk or non-dairy milk, with special care. For an even creamier consistency, make a batch with 1 part heavy cream to 3 parts whole milk. Yogurt is delicious with added fruit or sweetener, and great in many recipes. Complete, easy-to-use instructions from Cultures for Health are included in each box. Ingredients: Organic milk, live active bacteria (thermophilic culture). Non-GMO. Shipping Information and Shelf-life: Our Greek yogurt culture is shipped in a barrier-sealed packet as a freeze-dried yogurt culture. We recommend storing this product in the fridge or freezer upon arrival. Allergen Information: Gluten-free (less than 5 ppm). Manufactured in a facility that also produces products made dairy. Actual product may differ from image shown above.